With the Sony PMW F5 you’ll get superior, super-sampled pictures with noticeably higher contrast, rich color reproduction and greater clarity. Building on the success of Sony’s F3, the F5 offers robust internal recording modes, all with vibrant 4:2:2 color. Options include the precision of 16-bit linear RAW 2K/4K recording and high speed 2K RAW at up to 240 fps without cropping. The ultimate camera capture system would record every nuance of light and shadow from the image sensor, preserving every detail from every pixel for full exploitation in post-production. If you want the maximum flexibility that 4K and 2K RAW deliver, Sony’s optional AXS-R5 Access Memory System recorder is a remarkable choice. Unlike some RAW systems, Sony’s 16-bit linear capture preserves more tonal values than the human eye can differentiate. This is also the ideal match for the 16-bit linear ACES workflow. For simplified creation of offline proxies, the camera even provides simultaneous onboard recording to SxS® cards using the same start frame and stop frame as the RAW recording. Cinematographers paint their images with light and shadow. So the ability to render tones from deepest shadows to brightest highlights is a crucial test of any digital camera. The F5 excels, with 14 stops of exposure latitude. DPs have noticed that the camera holds remarkable detail in the highlights, while noise in the blacks is extremely low. The result? Graceful rendering of scene contrast, even in searing sunlight. The camera is rated at ISO 2000 (S-Log 2 gamma, D55 light source) for superb results in available light. Given all the effort Sony made to achieve 14 stops of exposure latitude, it would be a crime to crush this latitude in recording. That’s why Sony gives you a choice of grayscale encoding. It’s ironic that with focus so critical, most operators are stuck with viewfinders and on-camera monitors that offer middling contrast and resolution. 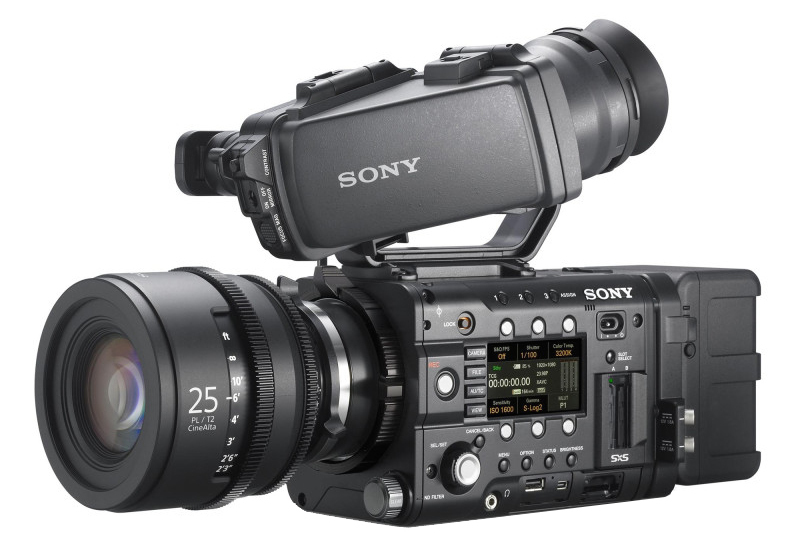 Sony changes all that with the F5. A new digital interface has given rise to a brilliant new series of viewfinders. Sony spent two years in close consultation with cinematographers and ACs. In particular, we focused on the ergonomics of handheld and shoulder-mounted shooting. The result is an ergonomic design unlike any previous Sony camera. It starts with a highly compact camera that builds up with modules to form an elegant, unified system. While the F5 offers the option of glorious 16-bit 4K and 2K RAW recording using the outboard AXS-R5 recorder, not every production is prepared to take advantage. That’s why the camera offers three internal recording formats ranging from 50 Mbps to 352 Mbps (at 24p). You can choose the codec, processing complexity and file size that match the needs of each project. From stunts and explosions to the fall of a single raindrop, F5 high-speed shooting is a powerful storytelling tool. The camera also performs Slow & Quick (S&Q) motion for overcranking and undercranking. This enables you to alter the narrative by speeding up or slowing down the action, choosing frame rates from 1 frame per second (fps) to the maximum in 1 fps increments. And with the F5, every high speed shooting, overcranking and undercranking mode delivers full quality. There’s no sacrifice in bit depth and no “windowing” of the sensor. So there’s no crop factor, no loss in angle of view. The camera offers powerful connections, including four HD-SDI outputs. There’s also HDMI®, USB, DC in connection, a removable XLR audio module and a removable time code/genlock module. The XLR inputs accept balanced analog signals, provide 48-Volt phantom power and will accept four channels of AES/EBU digital audio with an expected free firmware upgrade. At Sony, we don’t just know about cameras. We’re also a leader in battery technology. The F5 takes advantage of Sony’s innovative BP-FL75 battery pack, which uses Olivine—Lithium Iron Phosphate—instead of conventional Lithium Ion cathodes. The result is twice the number of charge-discharge cycles, compared to previous Sony batteries.